WrestleMania, 35th Edition in New York/New Jersey as its being billed as the, Kickoff Show @ 5 p.m. ET on WWE Network plus other Internet Platforms, TV preshow – 6 p.m. ET: USA Network or WWE Network & WrestleMania 33 -7 p.m. ET on WWE Network or pay-per-view. Setup to WrestleMania 35- On the March 4 episode of Raw, Braun Strowman got into a backstage confrontation with SNL‘s Colin Jost and Michael Che, with Jost questioning the legitimacy of professional wrestling, resulting in Strowman choke lifting Jost. The following week, Che and Jost attempted to apologize to Strowman by gifting him a new car, only for Strowman to dismantle it. On the March 18 episode, the annual André the Giant Memorial Battle Royal was officially confirmed when Strowman became the first to announce his participation. The following week, while as guests on “A Moment of Bliss”, Strowman challenged Jost to enter the battle royal. Che agreed on his behalf, and Jost in turn also agreed that Che would enter. As the host of WrestleMania 35, Alexa Bliss then made it official that both Jost and Che would be participants in the battle royal. Setup to WrestleMania 35- On the February 19 episode of 205 Live, General Manager Drake Maverick scheduled an eight-man single elimination tournament with the winner facing Buddy Murphy for the WWE Cruiserweight Championship at WrestleMania 35. The tournament occurred over the next few weeks. Tony Nese, Drew Gulak, Oney Lorcan, and Cedric Alexanderadvanced to the semifinals by defeating Kalisto, The Brian Kendrick, Humberto Carrillo, and Akira Tozawa, respectively. Nese and Alexander then advanced to the finals, which was won by Nese. Plus: Alexa Bliss will serve as host of the show, Elias will have a special musical performance, and Colin Jost and Michael Che serve as special correspondents. Prediction- Undertaker will interrupt Elias, will set up a match for the WWE next Saudi Event. 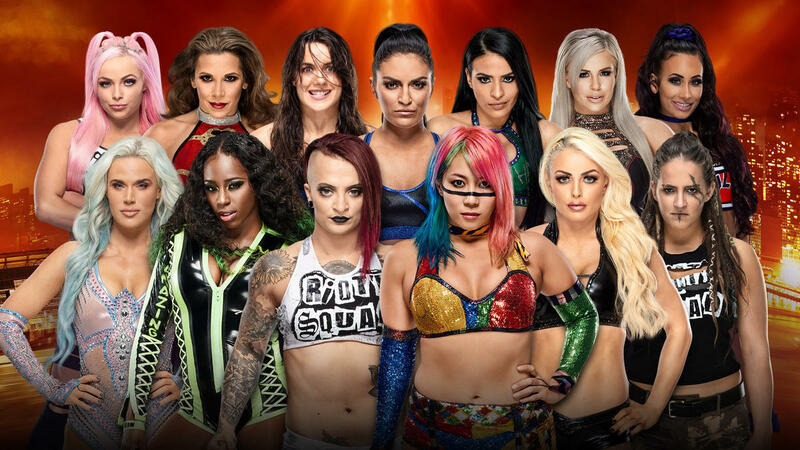 Setup to WrestleMania 35- At SummerSlam, Becky Lynch and Charlotte Flair were involved in a triple threat match for the SmackDown Women’s Championship, which Flair won. After the match, Lynch attacked Flair, ending their friendship. Lynch defeated Flair for the championship at Hell in a Cell and they continued to feud over the title for the next few months. At Survivor Series, Lynch was originally scheduled to face Raw Women’s Champion Ronda Rousey in a champion versus champion match, but was replaced by Flair due to a legit injury; during the match, Flair brutally attacked Rousey with weapons. At TLC: Tables, Ladders, & Chairs, Rousey interfered in the namesake championship match between Lynch, Flair, and Asuka, costing both Lynch and Flair the match. Lynch was unsuccessful in regaining the title at the Royal Rumble, but won the women’s Royal Rumble match by last eliminating Flair, despite injuring her own knee, and chose to face Rousey for the Raw Women’s Championship at WrestleMania 35. Lynch then refused a medical examination on her knee after a brawl with Flair on SmackDown. Stephanie McMahon gave Lynch an ultimatum: have her knee examined or be suspended until she does. Lynch still refused and was suspended indefinitely. By the following episode of Raw, Lynch had been medically cleared and her suspension was lifted, but Vince McMahon overruled the decision, suspended Lynch for 60 days, and replaced her with Flair at WrestleMania. Over the next couple of weeks, Lynch continued to violate her suspension and attacked Rousey and Flair both physically and on Twitter. Following pleas by Rousey to reinstate Lynch, the suspension was lifted on the March 4 episode of Raw. At Fastlane, a limping Lynch defeated Flair by disqualification when Rousey attacked Lynch. As a result, Lynch was added back into the championship match at WrestleMania to make it a triple threat match, which was confirmed to be the first-ever women’s match to main event WrestleMania. On the March 26 episode of SmackDown, after Lynch said Flair added nothing to the triple threat match, Flair defeated Asuka to win the SmackDown Women’s Championship. On the following episode of Raw, Stephanie announced that both titles would be on the line at WrestleMania, making the match winner takes all. Setup to WrestleMania 35- At the Royal Rumble, Seth Rollins won the men’s Royal Rumble match, thus earning a world championship match of his choice at WrestleMania 35. The next night on Raw, Rollins was given until the end of the night to choose his opponent. Later, after Universal Champion Brock Lesnar’s advocate Paul Heyman tried to discourage Rollins from challenging Lesnar, Rollins confronted Lesnar, resulting in a brawl. Afterwards, Rollins chose to face Lesnar for the Universal Championship at WrestleMania. On the March 11 episode of Raw, Heyman reminded Rollins of his previous encounters with Lesnar and Rollins was attacked by Shelton Benjamin, Lesnar’s old wrestling friend from the University of Minnesota and tag team partner in Ohio Valley Wrestling; Benjamin performed several German suplexes on Rollins, just as Lesnar would do, but Rollins nonetheless defeated Benjamin in a match. Rollins and Lesnar had one final confrontation on the April 1 episode of Raw, which resulted in Rollins delivering two low blows to Lesnar and The Stomp. Setup to WrestleMania 35- On the February 12 episode of SmackDown, Kofi Kingston was a last-minute replacement for an injured Mustafa Ali in a gauntlet match to determine who would enter last in the Elimination Chamber match for the WWE Championship at Elimination Chamber; Kingston pinned WWE Champion Daniel Bryan and lasted over an hour before being eliminated. At Elimination Chamber, Bryan retained the title in the titular match, with Kingston being the last wrestler eliminated. On the following episode of SmackDown, Kingston was granted a WWE Championship match at Fastlane after pinning Bryan in a six-man tag team match. The following week, however, Vince McMahon replaced Kingston with a returning and “more deserving” Kevin Owens. At Fastlane, The New Day (Big E, Kingston, and Xavier Woods) confronted Mr. McMahon, who scheduled a triple threat match for the title, however, Kingston was instead put in a handicap match against The Bar (Cesaro and Sheamus) and lost, while Bryan retained the title in his respective match. On the following episode of SmackDown, The New Day again confronted Mr. McMahon, who said that Kingston would have to win a gauntlet match to receive a WWE Championship match at WrestleMania 35. The following week, Kingston won the gauntlet match, but Mr. McMahon then forced him to also wrestle WWE Champion Daniel Bryan, who defeated Kingston. On the March 26 episode, The New Day teased leaving WWE and once again confronted Mr. McMahon, who decided that if Big E and Woods won a tag team gauntlet match, Kingston would in fact receive the championship match. Big E and Woods won after scoring a count out victory over their final opponents, Bryan and Rowan, thus securing Kingston’s WWE Championship match against Bryan at WrestleMania. The following week, Bryan and Kingston signed the contract to make the match official. Setup to WrestleMania 35- At Fastlane, Samoa Joe retained the United States Championship in a fatal four-way match by making Rey Mysterio pass out to the Coquina Clutch. On the following episode of SmackDown, Mysterio pinned Joe in a tag team match. The following week, Joe was scheduled to defend the championship against Mysterio at WrestleMania 35. However, Mysterio suffered an ankle injury during his match against Baron Corbin on the April 1 episode of Raw and is to be evaluated to determine if he can compete at WrestleMania. Prediction– Match could be altered, but if not I like Rey Mysterio to win. Setup to WrestleMania 35- At Elimination Chamber, Finn Bálor defeated Bobby Lashley and Lio Rush in a 2-on-1 handicap match to win Lashley’s Intercontinental Championship. Lashley regained the title on the March 11 episode of Raw thanks to assistance from Rush. On the March 25 episode, Bálor was originally scheduled to face Lashley and Rush in a handicap match where if he won, he would receive a title match at WrestleMania 35, but as Rush was not medically cleared, Jinder Mahal instead teamed with Lashley. Despite the odds, Bálor defeated Lashley and Mahal to earn a championship match against Lashley at WrestleMania. The following week, Bálor warned Lashley that he would be facing “The Demon” at WrestleMania. 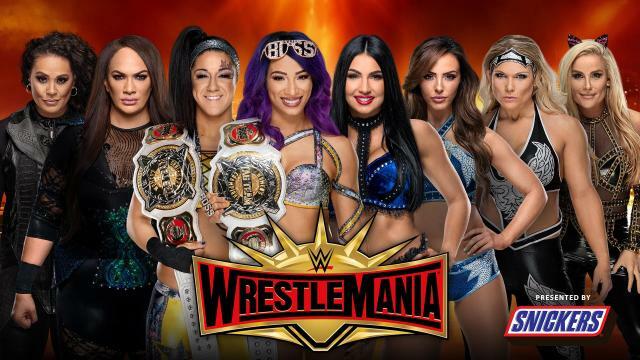 Setup to WrestleMania 35- After becoming the inaugural holders of the WWE Women’s Tag Team Championship at Elimination Chamber, The Boss ‘n’ Hug Connection (Bayley and Sasha Banks) stated that they would defend the titles across Raw, SmackDown, and NXT. After retaining the championship against Nia Jax and Tamina at Fastlane, for which they received a post-match beat down, The IIconics (Billie Kay and Peyton Royce) called out the champions on the March 12 episode of SmackDown. The following week on Raw, WWE Hall of Famer Beth Phoenix came out of retirement to reform The Divas of Doom with Natalya and challenge for the championship at WrestleMania 35. The next night on SmackDown, The IIconics defeated The Boss ‘n’ Hug Connection in a non-title match. The following Raw, after asserting that they would defend the titles against anyone, The Boss ‘n’ Hug Connection were scheduled to defend the titles against Jax and Tamina, The Divas of Doom, and The IIconics in a fatal four-way tag team match at WrestleMania. Setup to WrestleMania 35- On the April 2 episode of SmackDown, WrestleMania 35 host Alexa Bliss informed The Usos (Jey Uso and Jimmy Uso) that while it was honorable, there would be repercussions for forfeiting their gauntlet match against The New Day (Big E and Xavier Woods) the previous week and then scheduled The Usos to defend the SmackDown Tag Team Championship in a fatal four-way tag team match against The Bar (Cesaro and Sheamus), Aleister Black and Ricochet, and Rusev and Shinsuke Nakamura at WrestleMania. Setup to WrestleMania 35- On the April 1 episode of Raw, after The Revival (Dash Wilder and Scott Dawson) had retained the Raw Tag Team Championship against Aleister Black and Ricochet via count-out, Curt Hawkins and Zack Ryder challenged the champions to a match for the titles at WrestleMania 35, which was made official. Setup to WrestleMania 35- On the SmackDown 1000 special on October 16, 2018, Batista, who had last wrestled in WWE in 2014, made an appearance for an Evolution reunion. During the segment, Batista praised fellow Evolution member Triple H for having done everything in the wrestling business, except defeat him; during Batista’s first singles run in 2005, he defeated Triple H in all three of their only matches against each other. The two had a tense stare down before embracing, seemingly showing that there was no ill will between the two. However, on the February 25, 2019 episode of Raw, a celebration for fellow Evolution member Ric Flair’s 70th birthday was planned, but Flair did not show. It was then shown that Batista had attacked Flair backstage, seeking Triple H’s attention. Triple H called out Batista on the March 11 episode of Raw, where Batista stated that he wanted his final match to be on his own terms. He challenged Triple H to a match at WrestleMania 35, and Triple H accepted as a No Holds Barred match. Batista explained that his hatred for Triple H dated back to before their time in Evolution, claiming that Triple H had only used him and underestimated him. Batista then decided that he would not face Triple H unless Triple H put his career on the line, and Triple H agreed. Setup to WrestleMania 35- On the March 11 episode of Raw, WWE Hall of Famer Kurt Angle began his farewell tour, culminating with his farewell match at WrestleMania 35. The following week, Angle chose Baron Corbin as his final opponent, explaining that while there were many opponents he would have liked to have faced, Corbin was the only one he wanted to beat. Corbin had caused Angle many problems while Angle was Raw General Manager from 2017–2018 and eventually supplanted Angle, becoming Acting Raw General Manager until TLC in December 2018. Corbin said he was glad to be the one to end Angle’s career and boasted about his own accomplishments. On the April 1 episode of Raw, Angle challenged Corbin to an exhibition match that night, but Corbin declined, claiming Angle would not be able to make it to WrestleMania if they had a match before then. Prediction– Either this match is changed or Corbin wins. Setup to WrestleMania 35- At Crown Jewel, Shane McMahon won the WWE World Cup, replacing The Miz in the finals, who was deemed unable to compete due to a pre-match brawl. Following this, The Miz began a pursuit to form a tag team with Shane, claiming that they could become the “best tag team in the world”. Shane finally agreed to the pairing, and the two won the SmackDown Tag Team Championship at the Royal Rumble. They lost the titles at Elimination Chamber, and failed to regain them at Fastlane; in both matches, Miz was pinned. Following their match at Fastlane, a disappointed Miz and Shane hugged Miz’s father, who was in the front row. After Shane consoled Miz and his father, Shane then attacked Miz from behind, turning heel. On the following episode of SmackDown, Shane explained that he was tired of people using him. He claimed that he enjoyed beating up The Miz at Fastlane and wanted to do it again at WrestleMania 35, and then scheduled a match between himself and Miz for the event. Miz responded and said that people had warned him about Shane, but he did not listen. He said Shane was just as terrible as his father, Vince McMahon, and that he would defeat Shane at WrestleMania. Miz then challenged Shane to make the match a falls count anywhere match and Shane agreed. Prediction– The Miz defeats Shane-O-Mac to avenge his father. Setup to WrestleMania 35- For several weeks, AJ Styles and Randy Orton interrupted each other’s backstage segments on SmackDown, insulting each other. At Elimination Chamber, Orton eliminated Styles in the Elimination Chamber match for the WWE Championship. At Fastlane, after Orton had attacked Elias from behind with an RKO, he himself was then attacked by Styles with a Phenomenal Forearm. On the following episode of SmackDown, Orton took umbrage with Styles referring to SmackDown as “the house that AJ Styles built”, since Orton began his career on SmackDown in 2002 and became very successful, while Styles, who debuted in WWE in 2016, spent most of his career on the independent circuit (1998–2016), with Orton also referencing Styles’ time in Ring of Honor and TNA. Styles responded by saying that Orton had everything handed to him because of his family’s wrestling lineage while Styles had to actually work for it. Styles eventually challenged Orton to a match at WrestleMania 35, which was made official. Prediction– AJ Styles wins & this fued will continue. Setup to WrestleMania 35- On the October 22, 2018 episode of Raw, Roman Reigns went on hiatus due to leukemia. He returned on the February 25, 2019 episode and explained that his leukemia was in remission and that he would return to action. At Fastlane, Reigns, Dean Ambrose, and Seth Rollins reunited for one last time as The Shield and defeated the team of Baron Corbin, Bobby Lashley, and Drew McIntyre, and The Shield performed their signature Triple Powerbomb on McIntyre through a broadcast table. The following night on Raw, Reigns, who had not competed on Raw in five months, was scheduled to face Corbin, but McIntyre attacked Reigns before the match. Ambrose subsequently faced McIntyre in a falls count anywhere match in a losing effort. The following week, McIntyre challenged Reigns to a match at WrestleMania 35 and then defeated Rollins later that night. On the March 25 episode, after McIntyre brought up Reigns’ leukemia and family, Reigns accepted the challenge. The following week, Reigns said that although McIntyre’s previous attack had kept him out of action for a couple of weeks, he was cleared to compete at WrestleMania. McIntyre then attacked Reigns from behind. Check out the Flex Zone Spin Off show Goofy Central via The Flex Zone Youtube & Facebook Channel plus the Flex Zone every week as well.